A collection of rugs in different shapes and colors. The designer Diego Fortunato, was inspired by the smooth, rounded pebbles found on the seashore. Their irregular shapes and perfectly combinatorial colors allow the Stone-Wool rugs to be placed in a multitude of spaces and to create capriciously repetitive patterns. "They are woolen stones". A comment of Diego Fortunato: One stone from the beach, processed by the sea, is chosen and used to give shape to a woolen carpet, being processed again, this time by technological means entirely respecting its outline. This collection gives shape to a concept that breaks with the parameters of traditional design. Vacuuming is recommended at least once a week. Do not allow stains to dry-in and apply a suitable stain-removing solution. 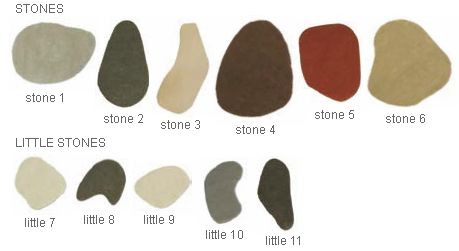 stone 1 - 3'3" x 4'6"
stone 2 - 3' x 5'2"
stone 3 - 2'5" x 5'9"
stone 4 - 3'9" x 5'2"
stone 5 - 3'3" x 4'4"
stone 6 - 4'6" x 4'7"
little stone 7 - 3'3" x 4'6"
little stone 8 - 2'1" x 2'3"
little stone 9 - 1'9" x 2'6"
little stone 10 - 2'3" x 2'8"
little stone 11 - 1'8" x 3'6"